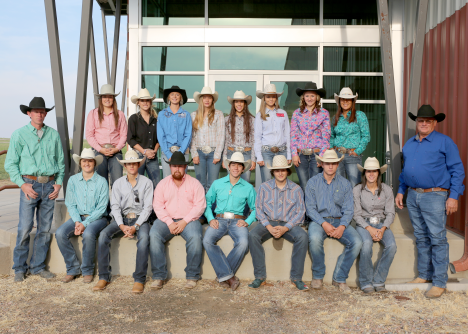 The Lamar Community College Rodeo team will host its annual Antelope Stampede through October 2, at the Prowers County Sand & Sage Fairgrounds. Fourteen teams from throughout Colorado, Wyoming and Nebraska will compete over three days with performances at 2:00 pm on Saturday, and 11:00 am on Sunday. Cost of entrance to the rodeo is $6.00 for adults, $4.00 for students, free to kids 12 and under. The Stampede is the team's third rodeo of the 2016-2017 season and Fred Sherwood, Runnin' Lopes head coach, is ready to compete at home. "We're looking forward to hosting the Stampede," said Sherwood. "We hope everyone will come out and support the team." LCC's roster this year is comprised of seventeen members including eleven on the women's team and six on the men's. Three of the top competitors on the women's team include sophomores Ashten Marchant and Jayla Reed along with freshman Tacie Canfield. Marchant currently sits at eighth place in the Central Rocky Mountain Region in goat tying. She finished last season in fifth place in the event, narrowly missing the cut-off to compete in the College National Finals Rodeo. Reed is a sophomore barrel racer from Wiley, Colorado. She competed well last year finishing ninth place in her event in region competition. Tacie Canfield is a new recruit out of McClave, Colorado, and is already performing well in her freshman season. She currently sits in eleventh place in breakaway roping in the region. "Our women's team is looking pretty strong this season. If they can perform to their abilities, we should be pretty competitive," commented Sherwood. The men's team is led by its sole returning sophomore, Kadyn Hicks. "Kadyn finished fourth in steer wrestling last season and so we expect good things out of him this year," said Sherwood. For more information on LCC Rodeo, visit golopes.com.